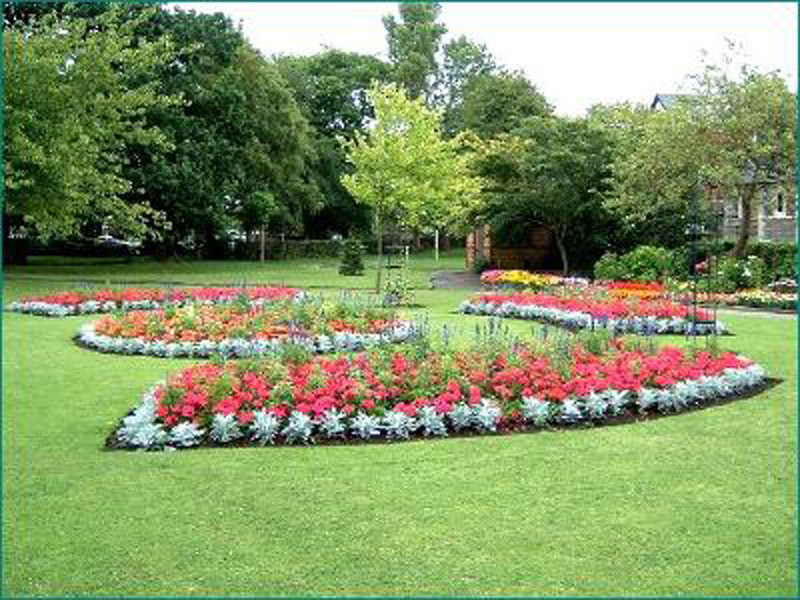 The first plan to create the open space that became Waterloo Gardens came in November 1895, when Lord Tredegar offered to present a plot of land near Roath Church to the Cardiff Corporation. This was the site which was under consideration some ten years previously as the location for Roath Park. The Tredegar Estate was now developing the area with new roads and houses, and suggested that if the Corporation would make a new road from Roath Church to the foot of Penylan (which was to become part of the future Waterloo Road), Lord Tredegar would present to the Corporation three acres of land to the south of the proposed road for the purpose of a garden or pleasure ground. A provisional agreement was signed on 5th October 1897, but development was delayed for a number of years. In June 1898 the Borough Engineer submitted an estimate of £1900 for laying out the new garden, then known as St Margaret's Open Space. Consideration of this by the Parks Committee was deferred but during 1899 the tipping of soil and refuse took place in order to level the site. At a Parks Committee meeting on 28th January 1901 the Parks Superintendent submitted a plan for laying out the garden and the Committee again deferred a decision. The delay was because a new route had to be provided for the Corporation to have access to its Newport Road tipping site later the Waterloo Allotments). To provide this it was necessary to fill in and divert part of Roath Brook at the St Margaret's Open Space and make a new road. This was completed in June 1901, when the Superintendent reported that the ground was ready to be laid out, but a decision was again deferred. The issue was not raised again until July 1907, when it was pointed out to the Council that it was required to create a public open space by the terms of Lord Tredegar's gift. The City Engineer and the Parks Superintendent were asked to report fully as to the laying out of the land to the next meeting of the Parks Committee, on 23rd September 1907. The cost of laying out the garden was estimated to be £1120 and the Committee resolved that the work be carried out forthwith. The present name of the garden was adopted at this stage - it was now referred to as the Open Space near St Margaret's Church, Waterloo Gardens. The Council approved the plans and costs on 13th July and application was made to the Local Government Board for permission to borrow £1120. The Local Government Board approved the application but made the condition that the construction work be carried out wholly by the unemployed and not by any workmen in the Corporation's employment. At this time there was a Cardiff Distress Committee whose function was to pay unemployed men to work for the Council on public improvements. The laying out of Waterloo Gardens finally took place in 1909-10. On 25th January 1909 the Parks Superintendent reported that the construction of iron railings was well in hand and that 12 men supplied by the Distress Committee were also starting to lay out the grounds. The following month he reported that 15 to 20 men were employed and that the "stone & iron fencing previously surrounding the Roath Green" was to be fixed along the boundary of Waterloo Gardens with Church Terrace. Roath Green was "a common of pasture lying on the west and north west of Roath churchyard. About 1893 the portion nearest the church was planted and enclosed by the Corporation..."
On 25th July 1910 the Superintendent reported that though by no means completed, Waterloo Gardens was ready for opening to the public. The opening ceremony on July 27th was performed by the Lord Mayor, and the Lady Mayoress planted a tree in commemoration. As was acknowledged at the opening ceremony, much development was still needed, including completion of the fencing and the building of a workmen's shelter. A grass tennis court was provided in 1920, and in the same year a children's playground was created on the southern side. A. A. Pettigrew reported on the provision of tennis courts in all the Cardiff parks in 1930 and recorded that in Waterloo Gardens there was one grass court. 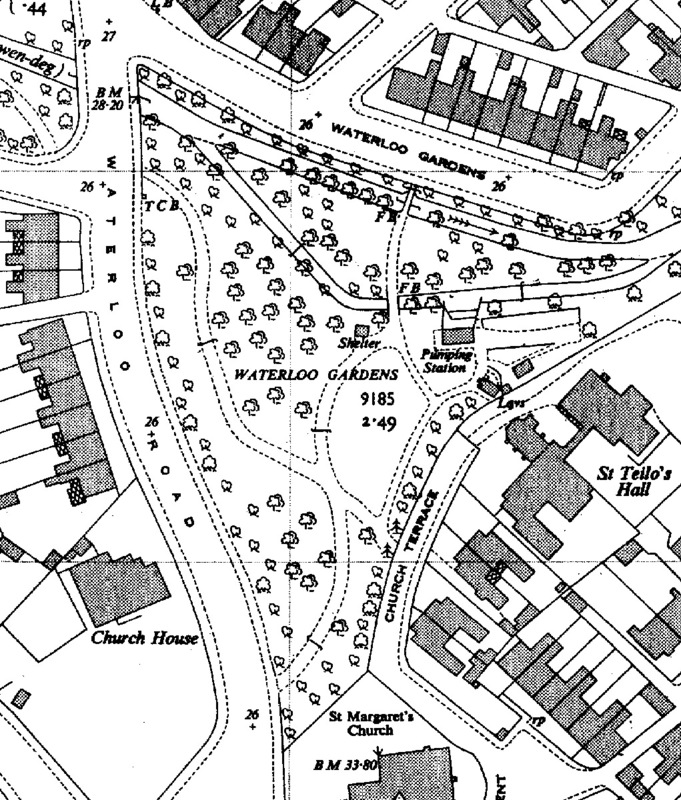 Flood prevention work was carried out along Roath Brook in the early 1930s and affected its course in Waterloo Gardens - a second channel was created along the northern boundary forming an island (as shown on the Ordnance Survey map below). A new bridge was provided to preserve access to the Gardens on the north side. Later in the 1930s the Parks Committee agreed to a request from the Public Works Committee for a relief sewer to be laid through Waterloo Gardens, and for a pump house in connection with the sewer to be erected there. In the 1940s musical entertainment was provided in Waterloo Gardens, as in a number of other parks and open spaces, using gramophone records and loud speakers. This equipment was installed in the summer of 1943. A 1942 aerial photograph shows Waterloo Gardens and a barrage balloon opposite the southerly entrance. The excerpt from the 1950s Ordnance Survey map below shows the position of the public shelter, pumping station and the lavatories none of which now exist. The map also shows the caretaker's shelter which is still present on the boundary near St Teilo's Hall, but is not labelled. The pumping station, which was housed in a small brick enclosure, from time to time discharged water from two large pipes, each of 12 inches diameter or more, horizontally across the stream, the water crashing againt the opposite bank. In 1959 the Parks Committee approved plans for a new foot bridge in Waterloo Gardens described as "pre-cast concrete beam units, steel balustrading with hardwood handrail and tarmac finish to the flooring." Major flood defence work started in the Waterloo Gardens in February 2017 and was completed by Autumn 2018. In general, the information in this section is taken from A. A. Pettigrew, The Public Parks and Recreation Grounds of Cardiff, Volume 5. Cardiff Parks Superintendent's Report Book (pdf) A handwritten book covering the period January 1908 to October 1912 inclusive, currently in the care of the Cardiff Council's Parks Service.